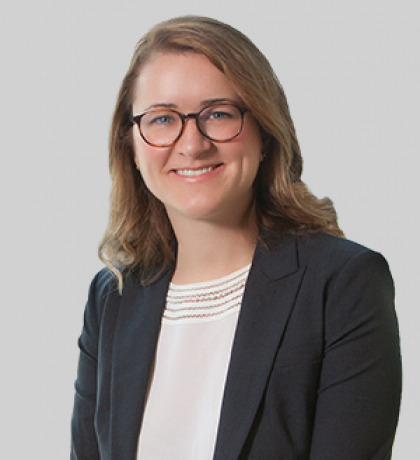 Hayes focuses her practice on issues surrounding environmental, land use, energy and administrative law. She navigates complex regulatory and political matters for her clients before government agencies, permitting officials and state and federal courts. Her experience includes representing private businesses in environmental remediation and clean-up activities; negotiating resolutions of environmental enforcement actions; litigation over agricultural exemptions to various environmental regulations; representing local governments and private citizens in water supply planning and surface water disputes; and obtaining local land use and zoning approvals for a wide range of projects. She also has experience with environmental due diligence and legal opinions for project financing transactions. A growing part of Hayes’ practice is in the renewable energy and CleanTech sectors. Hayes has spoken on the status of renewable energy policy in the southeast at the National Association of Environmental Professionals’ Annual Conference in 2018 and is a founder and regular contributor for the Elements for Growth Blog, which provides news, information and resources about infrastructure and economic development in the Southeast. Hayes was an attorney at Smith Moore Leatherwood LLP, which merged with Fox Rothschild in 2018. Before earning her law degree, Hayes spent two years with the Peace Corps as a Small Enterprise Development and Ecotourism volunteer in Senegal, West Africa.